I’ve had my WoodRiver #4 1/2 smoothing plane for over a year now. I’m very familiar with it and think it’s a fantastic plane and a great value for the money. So when my friend Wayne Brown stopped by with his brand new Lie Nielson bronze #4 smoothing plane I absolutely had to mess around with it and give it a light comparison to my WoodRiver. I didn’t go into an in depth comparison in the video. Mainly just a first impressions situation. What you get for your money when you buy a premium hand plane like a Lie Nielson is attention to detail and precision out of the box. There is no setup time for the lie Nielson. Simply wipe off the oil and get to work. The WoodRiver on the other hand will require some attention. An initial sharpening process is needed for the blade. The bronze body on the Lie Nielson is also a benefit as it won’t rust like iron will. But you can get the same plane from Lie Nielson in iron as well. Bottom line, there is no difference in performance of the planes actually doing work. You’re paying for attention to detail and a more overall refined product. The Lie Nielson is definitely a nicer plane. But is it worth the extra expense for you? That’s not something I can answer for you. If you want a really good plane without breaking the bank then a WoodRiver is a very appealing option. If you want a very nice piece of American made craftsmanship that will work flawlessly out of the box then a Lie Nielson is probably where you should look. As I said in the video, it’s probably not any new information. I was more or less taking advantage of the time to use the Lie Nielson plane. As a final statement I’ll say that while I enjoy both of my WoodRiver planes and am very pleased with my purchase I’d much rather have the entire line up of Lie Nielson planes sitting on my tool wall for a few reasons. The quality is second to none, my tools rust in my shop so bronze (if available per model) will aid in preventing rust, and supporting a USA small business is something I always lean towards when possible. Check out the WoodRiver planes HERE. Check out the Lie Nielson planes HERE. Remember NO DUST up the old periscope there !!! Jay, I appreciate all you do with your videos and blogs. I learn a lot while, veryoften, being very much entertained. Thank you very much. Would you say there is s big difference in the quality of work with a reconditioned Record or Stanley with a decently sharp iron and either one of the high-dollar planes? I’ve never had the opportunity to use the Lee Nielson or Wood River products, but I would doubt it. I can’t afford gold and diamonds, especially when my work is hardly up to that standard. I appreciate a tool my grandfather or his father might have used to make something that might outlive my grandkids. Actually, I do appreciate this article. It’s great for someone to verify that the planes do the same job even if a little bit of setup is required. It’s otherwise very hard to make that determination, and “better” is very subjective, so thank you! I cringed quite a few times during your video Jay, I know it’s been talked about many times over the years but, I would always place the plane down on its side or raised in front so the blade does not come into contact with the bench…my old carpentry teachers drummed it into us about it and it’s always stuck.. Many other well respected people in the hand tool world will disagree. I’ll always put the plane down in it’s normal orientation. The blade is metal and if the wood bench causes it to dull slightly faster I have no problem with that. I’d rather not have it exposed to have other items bump into it. @Marc, I understand where you are coming from with placing the plane on its side. I’m a shop teacher, the main reason I teach kids to do that is because I can never be sure what nails some kid has put in the benchtop when I’m not teaching in that room. So safe to lay it on its side. If it’s your own bench, then you know how clean it is and it is fine to put it blade done, as long as you don’t mind a mark or two in the bench if you bump/slide the plane by accident. My own plane on my bench I always place it blade done, never had a problem. But as Jay said it is totally personal preference. 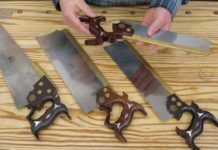 Marc – If you get a chance, take a look at some of Paul Sellers videos re hand planes. He goes to great lengths passing along more than 50 years of professional experience using hand tools; the hand plane being among the most used. He states time and again one does not need to place their plane on its side nor do they need to retract the blade when placing the plane on a workbench or other wooden surface. It does not hurt (or dull) the blade one bit. Now, if one has a steel or stone bench, that might pose a problem. If you have seen his videos, I apologize. Nice video, thanks. While you point out that the overall performance is about the same between the two planes, I personally would rather put the extra money towards a second Wood River plane, than for the flash and bragging rights of the more expensive plane. Thanks for the article Jay. I will say that the LN is the better tool because it has better components and is ready to use. It’s more than just attention to detail, it’s better parts making a better plane. 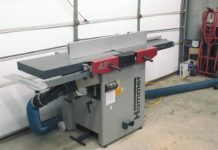 I am confident (I’ve never owned LN planes, but have used several) that my work would be more efficient if I had LN planes as opposed to the Stanley Bailey’s I own, but that doesn’t affect much in my home shop. That being said, if my livelihood were at stake, it’s LN all the way without question. The LN is made in the United States by American workers who earn a living wage. Similarly, the Veritas planes are made in Canada. Both are high quality tools. Veritas tends more toward bevel up planes and more innovative designs. LN is pretty much the gold standard for traditional Stanley Bedrock style bevel down planes. On the other hand, the Wood River planes are made in China, by workers paid piddling wages under a Communist regime. If we assume the Wood River tool is a quality item, and it seems to be, and the labor cost difference is the explanation, and it almost certainly is, the question is: who do you want to support with your purchase? Our workers or somebody not ours? Our country or friend Canada or stifling China? Many tool purchases now pretty well force China (power tools) but on hand bench planes you have a choice. Fit and finish isn’t the difference, much. It’s the labor. Very good video. Thank you for posting it. 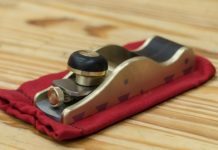 I have a Lie-Nielsen 4 1/2 smoothing plane, which I have had for 5 years, and a number of Wood River planes, most of which I have purchased in the last two years. I really like both. From an engineering point of view, I think the Lie-Nielsen planes are second to none. From a performance view, I see very little difference between the Lie-Nielsen and Wood River planes — after set up. As for day-to-day stock preparation, the first plane a reach for is always a $40.00 Stanley Bailey 15″ Jack plane set up with a slightly curved blade. The only thing I am going to change with this one is replacing the plastic handles with wooden handles. It is an excellent plane and an astonishingly good value for the money. The first plane I reach for when I want to smooth a board after using the Stanly #5 is the Lie-Nielsen #4 1/2, but only because it is a bit wider than my Wood River #4, which is also an excellent smoothing plane. My favorite all-around woodworking tool is my Lie-Nielsen low-angle block plane. It is a beautiful tool to work with. I have had it for a decade and I still love to just hold it in my hand. The recommendation I make to others is to start with Stanley Bailey bench, block, and shoulder planes. If they then want to upgrade after that, I recommend the Wood River planes as the best value for the their money. Though I love all my Lie-Nielsen tools, they are costly and, I think, better suited to serious woodworkers with a serious budget to match. I have yet to try Lee Valley Veritas planes, but their cabinet scrapers and router planes are fantastic.